1910 (March 10): George Van Tassel was born. 1947: George Van Tassel moved his family to Giant Rock, California where he developed a small airstrip, a guest ranch and a coffee shop. 1952 (July 18): George Van Tassel claimed to have received telepathically channeled messages from an extraterrestrial being named Ashtar. 1952: Robert Short promoted the Ashtar messages, establishee the Ashtar Command, and also channeled Ashtar. 1953 (August 24): George Van Tassel claimed a physical encounter with extraterrestrials and a UFO experience. 1953: Robert Short claimed a physical encounter with extraterrestrials and a UFO experience. 1953-1977: George Van Tassel hosted yearly Giant Rock Spacecraft Conventions, with attendance as high as 11,000. 1978: George Van Tassel died. 1982: Tuella publishedProject World Evacuation by the Ashtar Command and warned people that mass evacuations of the planet were immanent. 1986: Yvonne Cole warned her followers that the destruction of Earth would occur in 1994 and the Ashtar Command would be evacuating the planet. “I seem to enter into an area of golden mist… Within this ‘golden density’, which seems to be boundless in it’s (sic) extent, I hear a soft resonant voice speaking these words. As I hear the words, they are either taken down in shorthand, or taped, as I repeat aloud what I hear… Everyone seems to think this sounds like God speaking in the first person. Possibly so, I can only tell you how I receive the words and record them” (Van Tassel 1968:15). The second group’s founding coincided with messages Van Tassel claimed to receive telepathically beginning on January 6, 1952 from beings in spaceships (flying saucers) that were coming near the planet. The Ministry of Universal Wisdom promoted itself as a scientific research consortium interested in the “UFO experience.” Although its research also investigated and encouraged forms of spiritual healing, the primary focus was on collecting and analyzing information related to UFO activities. Van Tassel’s first contact with Ashtar (the “chief” or commandant of all the intergalactic forces) was reported on July 18, 1952. This first contact was not a traditional form of face-to-face contactee encounter but rather, Van Tassel claimed that he was telepathically receiving transmissions that were being sent through advanced extraterrestrial devices. As a form of ESP, he claimed that he was in “resonance” with the messages being sent and that by attuning his mind and body through certain techniques, including meditation practices, he was able to maintain contact with the extraterrestrial beings. During weekly Friday night channeling sessions, training sessions, and retreats at Giant Rock, Van Tassel taught others the techniques he practiced and encouraged further communication with extraterrestrials thought this form of telepathy. Van Tassel continued to communicate messages from a number of space beings (e.g., Portla, Maxslow, Lax, Blaroc, Noot, Vela, etc. ); however, the Ashtar messages were given prominence as they were claimed to be from the most important and powerful extraterrestrial patrolling the galaxy. These first messages were published in 1952 by Van Tassel in the book, I Rode a Flying Saucer: The Mysteries of the Flying Saucers Revealed . Although the book implies the author rode in a flying saucer, in effect, the book is just a summary of the messages Van Tassel received from beings in flying saucers. On August 24, 1953, Van Tassel did claim that a spacecraft landed at the airstrip in Giant Rock and 4 aliens contacted him is person. He stated that the flyin`g saucer was a scout ship operated by a being named “Solgonda” that had been sent from a larger mother ship that had travelled to Earth from Venus. While on the ship he claimed he was given the information and a formula to build a time machine (F= 1/T). 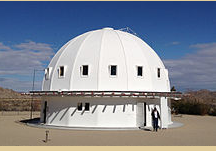 Based upon this contact, in 1954, Van Tassel began construction of the “Integratron” on his property at Giant Rock. [Image at right] The Integratron was a large dome shaped building, that when completed, among other things was believed to be able rejuvenate human cell structures and prolong a person’s life. Van Tassel raised money for the construction by soliciting donations through the newsletter of the Ministry of Universal Wisdom and public speaking events. It was rumored that Howard Hughes (a former employer of Van Tassel) contributed significantly to the project. Coinciding with Van Tassel’s UFO contact experience of 1953, he began hosting the yearly Giant Rock Spacecraft Conventions (1953-1977), which regularly drew thousands of participants. By 1955, the UFO conventions held at Giant Rock regularly attracted the “who’s who” of the current UFO contactee crowd, including Truman Bethurum, Kenneth Arnold, George Adamski and Charles Laughead. Attendance was recorded as high as 11,000, and in 1957, Life Magazine sent photographer Ralph Crane to cover the event. Published May 27, 1957 as the story “A Saucer Session for Spaceship Sighters,” the article gave a number of accounts from attendees concerning ET encounters and their travels on spaceships to Mars, Venus, and the Moon. The article mentions Van Tassel and his UFO encounter along with events reported by Truman Bethurum, Ruth May Weber, and Howard Menger (Life Magazine 1957:117-18). 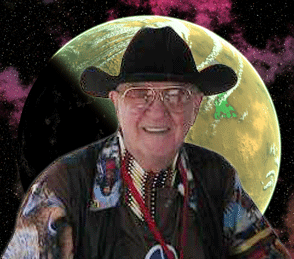 As larger crowds began attending the Giant Rock convention, Van Tassel became a bit of a celebrity and spoke frequently on radio and television shows promoting his encounters with UFOs, the UFO contactee experience, and Ashtar. As Ashtar and the Ashtar Command (a term used to describe the large galactic fleet in service to protect the galaxy) became more popular, many people began to claim that they were also able to channel messages from Ashtar. During that same year, the Ministry of Universal Wisdom makes it clear that Short was not in contact with the original Ashtar, and George Van Tassel was never apart of Mr. Short’s organization. The Ashtar Command emphasized the spiritual nature of contact available between Ashtar and humans and by 1955, several “mediums” and “psychics” began to promote messages. Along with spiritual connections, contactees also began claiming more physical encounters describing space ships, extraterrestrials, and life on other planets including the moon, Venus, and Mars. By this time, Robert Short had also claimed physical contact with extraterrestrials. After this schism, Van Tassel claimed extra authority to authenticate messages and also contact experiences stating: “In my contact with 4 men that landed here on August 24, 1953, they gave me information which they told me to use as a ‘key’ to establish authentic. Or phoney, contactees in the future” (Van Tassel 1957:5). Through this “key,” Van Tassel would confirm or deny that individuals were properly channeling messages and had real UFO encounters. As Van Tassel continued to host the Giant Rock Spacecraft Conventions, he also publically demonstrated his telepathic communication with extraterrestrials. For example, in 1958 on the main platform used by speakers at the convention he stated: “NOW who am I talking to? Well, somebody else keeps butting in! CONFOUND IT, YOU KEEP SWITCHING AROUND ON ME! Let’s settle on who is to do the talking tonight!… I AM KNUT. I BRING YOU LOVE.” As the channeling continued, Van Tassel described the type of flying saucer Knut was using and also its location (Bishop and Thomas 1999). Despite the channeling, Van Tassel appears to have shifted his teachings to be more focused upon the UFO experience as a physical manifestation. In his 1956 book, Into this World and Out Again: A Modern Proof of the Origin of Humanity and its Retrogression from the Original Creation of Man, there is no mention of Ashtar. In fact, none of Van Tassel’s later books or newsletters reference Ashtar or the Ashtar Command. What becomes more pronounced are Van Tassel’s interpretation of biblical texts to support his belief that extraterrestrials from outer space have been interacting with humans on Earth for a long period of time. He argues that it was a misunderstanding of people, based upon their culture and scientific level at the time that gave the impression these beings were gods or angels. “I for one am not making a religion out of anything. I am only trying to explain in this time what caused the superstitious people of another time to record those events to the best of their knowledge—when they did not understand the faintest scientific thing about what caused a cloud, or a corona of fire. I am only trying to explain phenomena that occurred then, in the present understanding of modern electrical science now. I am trying to prove scientifically that religion is a reality, instead of an intangible, superstitious myth… I am not changing anything that religious books say. I am only explaining what caused the phenomena that was not understood by the people then” (Van Tassel 1976:26). Despite Van Tassel shifting his focus away for the Ashtar messages, by the mid-1950’s, Ashtar and the concept of a galactic law enforcement agency preparing to protect or rescue humans from Earth had become well known within various UFO groups and contactee movements. Robert Short continued to promote this form of message, and numerous well-known mediums and members of spiritualist movements claimed to be contacted by Ashtar. This included Richard Miller, Elouise Moeller, Mrs. E.P. Hill, and Marian Hartill. As many of these people were involved in spiritualist type movements, like the I Am Society, it is no surprise that the messages coming from Ashtar began to shift to take on a more spiritual dimension. Although in the 1950s, the messages were still focused upon the imminent arrival of large numbers of physical spacecraft to assist humans here on Earth. The initial descriptions and accounts of the Ashtar message are focused upon intervention with scientific developments on Earth. In the channeled accounts of Van Tassel, Robert Short, and others, Ashtar is presented as a physical being on a very real space mission. He is the commander of “allied space forces,” deployed on an urgent interstellar mission to save humankind from its own destructive developments. There is only a minimal amount of spiritual language in the early messages, with much of the focus on the technical aspects of more advanced beings, the languages they use, the structure of the Ashtar forces, and pseudoscientific information concerning energy sources, communication frequencies, space ships and futuristic technologies. 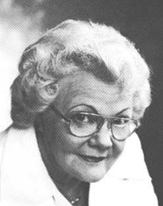 For example, in 1955, Elouise Moeller channeled a question and answer session from the Ashtar Command concerning their ships, space travel, life after death, and life on Venus. She believed that a fleet of spacecraft from the Ashtar Command would be arriving on Earth at any time. Adelaide J. Brown channeled messages explaining the types of beings living on the other planets in the solar system and how Ashtar would be providing information about building a spaceship to a scientist on Earth “of the highest caliber” after which we would be able to travel to the other planets to interact. As the messages coming from Ashtar increased, there was a great deal of anticipation that large numbers of extraterrestrial ships would be landing on Earth to assist humans and end wars, famine, government corruption, and the like. Although Robert Short continued to promote the Ashtar message, he was not the group’s leader. In effect, dozens of people were claiming authentic contact with Ashtar and there were a number of conflicting messages, all of them ending with failed prophecies concerning the physical arrival of Ashtar on the planet. I am seven feet tall in height, with blue eyes and a nearly white complexion. I am fast of movement and considered to be an understanding and compassionate leader. I am devoted to the principles and teachings of Our Radiant One, and I represent the Twelfth Kingdom and the Great Central Sun Hierarchy. I have been assigned the name of ‘Ashtar’ by that Universal Hierarchy for use in my calling as Commander of the Intergalactic fleets serving this hemisphere. Project World Evacuation, was widely circulated in the 1970’s before it was first published in 1982 and represented the first “official message” of the Ashtar Command as channeled by Tuella. Unlike Van Tassel’s message that warned Earth would be destroyed by the testing of the hydrogen bomb, Tuella claimed that most life on Earth was going to be destroyed by “disruptions to the magnetic field.” The disruptions were said to have come from thousands of years of negative energy building up in the atmosphere. As the promised ships never arrived, Tuella’s message began to shift from direct physical intervention to indirect spiritual assistance from afar. After continued failed prophecy, Tuella’s message had less content concerning physical UFOs and increasingly emphasized the spiritual nature of liberation and the religious teachings of Ashtar. In effect, she altered the Ashtar Command to become a more traditional form of theosophical movement. Eventually Ashtar emerged as “highly evolved in the upper worlds, very influential … equal to and often beyond the force-field even of Ascended Masters.” Tuella began making this shift more explicit in her book Lord Kuthumi: World Message for the Coming Decade (1985), focusing upon the need for spiritual salvation rather than extraterrestrial intervention. Shortly before her death, Tuella published Ashtar: Revealing the Secret Identity of the Forces of Light and their Spiritual Mission on Earth (1994) and her final volume of channeled messages, A New Book of Revelation (1995), where she presents an apocalyptic version of the future, arguing the human race must make an ascension or transition to a more spiritual way of being if it is to survive. 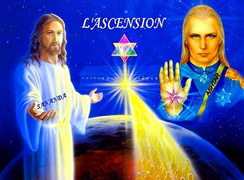 Despite Tuella’s shift from extraterrestrial evacuation of the planet to spiritual ascension of humankind to a higher dimension, several Ashtar channelers continued with a more UFO-based cosmology. This made the formation of a cohesive post-Tuella Ashtar Command movement problematic. Even with Tuella’s shift to a more spiritual form of transformation, several people claiming to channel Ashtar continued to promote Earth evacuation scenarios, mass landings of UFO’s, and immanent physical contact as part of their message. As 1994 came and went and no mass landings occurred, the messages developed to include guidelines for what was to be considered “authentic” Ashtar communications versus messages that were being communicated from negative aliens or fallen angelic beings to make Ashtar look bad. With the developing use of the Internet by the group in the 1990’s with Usenet and IRC, then with the WWW and Ashtar.org in 1998, the Ashtar Command presented a more unified version of the teachings. Issues of failed prophecy, whether it was from Ashtar messages in the 1950s or the 1990s were classified as misinformation presented by negative space beings located in the upper atmosphere that intercepted “broadcasts” and deceived “receivers.” A key narrative developed at this time that claimed several young members of the Ashtar Command had defected and they in-fact were responsible for most of the erroneous landing dates given to channels. Over 250 people participated in the second “Lift-off Experience” through a form of guided meditation. After the event, the group declared that a permanent portal had been opened between Earth and the Ashtar Command ships and that any members of the group could now have their vibration raised to be transported to the vessels. The “Lift-off Experience” involved an eight-step process that repeating the mantra: “I AM a guardian of the Light, I AM Love in action here, cooperating with the Ashtar Command. I AM dedicated to the Kingdom of God on Earth, Interplanetary Fellowship, and Universal Peace.” The voyage of the member was to occur during a meditative or even sleep state and would later be revealed to the individual in some form of conscious recall. As the Pioneer Voyage continued, a core group of Ashtar Command members from Australia began posting detailed accounts of their time aboard Ashtar’s ships. They described things such as the ships designs, the uniforms they wore, living quarters, and other information about their adventure. Other members then began posting similar messages online, discussing their activities and roles in Ashtar Command. Members that claimed they had not had the experience were encouraged to keep participating, and in some cases were even told that they were seen aboard the ships, but that they simply had not had conscious recall of the event yet. Through a number of websites, the Ashtar Command movement continues to develop and present information concerning advanced extraterrestrial beings. Several sites are key to this movement including Ashtarcommandcrew.net, Ashtarcommand.org, Ashtar.galactic2.net, and the Ashtar Command Tribe on Facebook. There were two major components to Ashtar doctrines and beliefs: an early apocalyptic component, and a later divine Ashtar component. Hail to you beings of Shan, I great you in love and peace, my identity is Ashtar, commandant quadra sector, patrol station Schare, all projections, all waves. Greetings, through The Council of the Seven Lights, you have been brought here inspired with the inner light to help your fellow man. You are mortals and other mortals can only understand that which their fellow man can understand. The purpose of this organization is, in a sense, to save mankind from himself. Some years ago your time, your nuclear physicists penetrated the “Book of Knowledge”; they discovered how to explode the atom. Disgusting as the results have been, that this force should be used for destruction, it is not compared to that which can be. We have not been concerned with their explosion of plutonium and UR 235, the Uranium mother element; this atom is an inert element. We are concerned, however, with their attempt to explode the hydrogen element. This element is life giving along with five other elements in the air you breathe, in the water you drink, in the composition of your physical substance, hydrogen. Their efforts in the field of science have been successful to the extent that they are not content to rest on the laurels of a power beyond their use, not content with the entire destruction of an entire deity at a time. They must have something more destructive, they’ve got it. When they explode the hydrogen atom, they shall extinguish life on this planet. They are tinkering with a formula they do not comprehend. They are destroying a life giving element of the Creative Intelligence. Our message to you is this: you shall advance to your government all information we have transmitted to you. You shall request that your government shall immediately contact all other earth nations regardless of political feelings. Many of your physicists, with an inner perception development have refused to have anything to do with the explosion of the hydrogen atom. The explosion of an atom of inert substances and that of a living substance are two different things. We are not concerned with their deliberate determination to extinguish humanity and turn this planet into a cinder. Your materialism will disagree with our attempt to warn mankind. Rest assured, they shall cease to explode life giving atoms, or we shall eliminate all projects connected with such. Our missions are peaceful, but this condition occurred before in this solar system and the planet, Lucifer, was torn to bits. We are determined that it shall not happen again. The governments on the planet Shan have conceded that we are of a higher intelligence, they must concede also that we are of a higher authority. We so not have to enter their buildings to know what they are doing. We have the formula they would like to use. It is not meant for destruction. Your purpose here has been to build a receptivity that we could communicate with your planet, for by the attraction of light substances atoms, we patrol your universe. To your government and to your people and through them to all governments and all people on the planet of Shan, accept the warning as a blessing that mankind may survive. My light, we shall remain in touch here at this cone of receptivity. My love, I am Ashtar. Our efforts are in the cause of peace, true peace. Many of your higher authorities throughout the nations of the planet Shan have lost all comprehension of the word, peace, for they are under the influence of the forces of darkness. The first thought that enters the minds of those in this darkness is not to find out what the other object of our visitation is, but rather to destroy us, to find out what we are made of. We can assure you that all their efforts, made with the objects of destruction, will avail them naught. Those individuals assigned with mortal beings in the higher light on the planet Shan, at will. We are not desirous of staging a show but I will inform you that if opposition forces, mortal or otherwise, persist in their efforts we can put 100,000 units a second in operation. They will be financially embarrassed to produce mechanical aircraft at that rate. For those few whose mentality is not diverted, men of science, I shall inform you that our ships could not be visible to the mortal eye of the people of Shan were it not for the elements in your atmosphere. A few enlightened minds will understand that. It is difficult to make one reason who has lost all reason. It is difficult for any mortal to conceive of higher intelligence in various stages, they have been away from it so long. I would also inform your government of this nation that the information that was mailed to the Intelligence, was transmitted to foreign nations out of their own office. In the light of a peace beyond the comprehension of mortal beings, we shall remain with you, I am Ashtar, commandant, station Schare. This release of free hydrogen into the atmosphere of this planet, will cause flames to engulf many portions of this planet momentarily. Those in authority, in the governments, are assuming direct responsibility, not only for the people inhabiting this planet, but their own immediate families, wives, children, parents and relatives are also their responsibility, for these dear ones shall not escape. you in authority, of the governments of the planet Shan, think twice if you would have your loved ones with you. Consult your physicists, ask them about the parallel condition of frozen equilibrium. They will inform you, if they speak the truth and are not influenced otherwise, by the forces of darkness, that this is truth. Wake up, you who would believe only those who direct you. Stand before the people. Tell those who influence your mental decisions, that they too are involved. In the light of love, I transmit you a continuous beam here, through a ventla which has been stationed in this cone of receptivity at a level 72,000 miles above you, beyond reach of any traps. I shall return, my love, I am Ashtar (1952:36-37). I am Ashar, commandant Vela Quadra sector, station Schare. As we informed you, our center has authorized 3 sub-station within the vortices of your planet Shan. Each of these stations now are in a position to release five hundred thousand ventalas each. Our center instructs me to inform you that you are once again about to see the use of atomic weapons in warfare. I am further requested to extend our gratitude to you for maintaining this contact vibration. In the Light of true Love and peace, I am Ashtar (1953:46). Hail in love and peace. I am Ashtar, Commandant Vela Quadra sector, station Schare. You have just heard the authority granted by Schonling Lord God of the 3rd dimensional sector, for our authority to take corrective measures. We are crating a Light energy vortices near the planet Shan in an effort to stabilize your planet. This effort requires the combined forces of 86 projections, 9100 waves, of 236,000 ventlas. Needless to say this vortices is going to create extensive damage to counteract the unbalance man has created on Shan. Our center extends to your their love and blessings. My Light, I am Ashtar (1953:46-47). Greetings in love and peace, I am Ashtar, Vela Quadra sector, station Schare, Commandant. We wish to instruct you to prepare for violent disturbance of Shan. We are having our first indications of success in arresting the attitude of Shan. My Love, I am Ashtar (1953:47). Greetings in the Light of love and peace, I am Ashtar, Commandant, Vela Quadra sector, station Schare. Our survey of the solar system of Salon indicates that the other planets of this system have not been effected by the actions of the people of the planet Shan. You will continue to witness very unusual weather conditions. Many of the ventlas from the sub-stations established near your planet will become very active in your atmosphere in your months of April to September. I am asked to advance gratitude and congratulations through to you from our center. My Light and my love, Ashtar (1953:47). As time went on, messages continued to warn the people of Earth of impending catastrophe. Issues or wars, extreme weather, earthquakes, and an immanent polar axis shift were all prophesized by Van Tassel. To communicate this information to members of the group, Van Tassel published an annual newsletter called “Proceedings of the College of Universal Wisdom.” In the “proceedings” Van Tassel criticized the government, presented new and novel scientific information, argued that UFO were in continuous contact with Earthlings, and continued to disclose channeled messages. Many issues of Proceedings started messages that were channeled by Van Tassel from “The Golden Destiny.” However, by the end of 1953, Ashtar and the Ashtar Command is not mentioned in the newsletter. Although a number of psychics and channelers presentedt messages from Ashtar over the next decade, the messages presented by Tuella (Thelma B. Terrill) in the 1970s and 1980s gained the most recognition. Referencing earlier messages Tuella, channeling Ashtar stated, “The messages of the past, as well as the present, carry the same burden of concern for Human-kind. We do not change our concern with the passing of time. A call of twenty or even thirty years ago is just as valid this day. Our messages have found a more tolerant audience at this time because of the ongoing exchange. Nevertheless, the need for them is crucial at this hour – not only for a further emphasis, but for the benefit of those who may not have seen them at all” (1985:5). The early messages from Tuella were focused upon the evacuation of the planet Earth by Ashtar and the Ashtar Command. We have millions of space ships stationed in the skies above your Planet, ready to instantly lift you off at the first warning of your Planet’s beginning to tilt on its axis. When this happens, we have only a very short time in which to lift you from the surface before great tidal waves will lash your coastlines – possibly five miles or more high! They will cover much of your land masses! These tidal waves will unleash great earthquakes and volcanic eruptions and cause your continents to split and sink in places and cause others to rise. We are very experienced in the evacuation of populations of planets! This is nothing new for the Galactic Fleet! We expect to complete the evacuation on Earth of the Souls of Light in fifteen minutes – even though they are of a tremendous number. We shall rescue the Souls of Light first. On our great galactic computers we have stored every thought, every act you have done in this and previous lifetimes. Our computers are locked onto the coordinates where you Souls of Light are located. At the first indication of need to evacuate, our computers will lock onto the location of those Souls where they are at that instant! After the Souls of Light have been evacuated, then the children will be lifted off. The children are not old enough to be accountable, so they will be evacuated to special ships to be cared for until they can be reunited with their parents. There will be people specially trained to handle their trauma. Many may be put to sleep for a while to help them overcome their fear and anxiety. Our computers are so sophisticated – far beyond anything ever used on Earth in this Age – that they can locate Mothers and Fathers of children wherever they are and notify them of their safety. Make no mistake, your children shall be lifted to safety during the Great Evacuation. After the evacuation of the children, the invitation will be extended to all remaining souls on the Planet to join us. However, this will be for only a very short time – perhaps only 15 minutes. There is no question of having enough space on board the ships for you, but because the atmosphere by this time will be full of fire, flying debris, poisonous smoke, and because the magnetic field of your planet will be disturbed, we will have to leave your atmosphere very quickly or we, also, with our Space Ships, would perish. Therefore, he who steps in to our Levitation Beams first will be lifted first. Any hesitation on your part would mean the end of your Third Dimensional existence you call the Physical Body. (Tuella 1985:52-56). Lord Ashtar is an Ascended, Immortal and “Christed Master.” He is of the race of the Adam Kadmon HU-Man and is a Ray emanation of “son” of the one know as Lord Sananda (Jesus) and His Divine counterpart or twin-flame, and the one know as Lord Michael… being formed of the combined blending of their Light Codes and Essences (from www.Ashtar.org a website actively used by the group from 1998 to 2005). Although the teachings and message are now focused upon a spiritual or supernatural Ashtar, the “Pioneer Voyage” and the “Lift-Off Experience” become central elements of the movement after 1994. Members of the group believe that they can be co-located aboard spaceships and actively engaged with the Ashtar Command even while they are physically here on Earth. Through a form of guided meditation and specific mantra, members are taught that they can experience a “physical vibrational transfer” and have continued, meaningful encounters with Ashtar. Much of the ritual practice associated with the Ashtar Command focuses on channeling extraterrestrial messages. George Van Tassel originally promoted a form of mediation and telepathy. Initially, with The Brotherhood of the Cosmic Christ, weekly channeling sessions were held in the room under the huge boulder at Giant Rock. During these events, members were thought to be able to go into a meditative/trance state where they “resonated” with the frequency of the beings transmitting the messages. This activity was presented as a scientific process that allowed the “receiver” the ability to tune in and receive messages that were being broadcast. They were never taken over or possessed by ETs or Ashtar, rather they were seen as being able to operate as special transmitters of the message, nothing more. As Robert Short began promoting the Ashtar messages and Ashtar Command, channeling Ashtar took on a more “spiritualist” form of communication and mediumship. Although Short would use technologies such as HAM radio and television signals to receive messages from Ashtar and ETs, the majority of the ritual associated with communicating with Ashtar was done through forms of mediumship and automatic writing. This ritual practice recognized that the person channeling the message was a vessel through which ET and “higher light beings” could communicate. In effect, the person channeling the message became a passive recipient for higher beings and forces. This type of channeling was counter to what was promoted by Van Tassel. As the movement developed, another key ritual activity was the yearly spaceship conventions held at the Giant Rock property owned by Van Tassel. During these events, thousands of people would travel to the desert to share UFO stories, look for UFOs, hear famous contactees recount their experiences, buy UFO souvenirs and also here people like Van Tassel communicate ET messages. In 1957, Life Magazine sent photographer Ralph Crane to cover the event. Published May 27, 1957 as the story “A Saucer Session for Spaceship Sighters,” the article gave a number of accounts from attendees concerning ET encounters and their travels on spaceships to Mars, Venus, and the moon. The article mentions Van Tassel and his UFO encounter along with events reported by Truman Bethurum, Ruth May Weber, and Howard Menger (1957:117-18). As the movement developed in the 1990’s a new ritual practice was established by the group that recognized a form of astral/etheric body travel or lucid dreaming that allowed individuals the opportunity to experience life aboard ET ships. Called the “Lift-off Experience” members were encouraged to practice forms of meditation and visualization that allowed them to experience “physical vibration transfer.” During this practice, members claim to be aboard spaceships performing important roles for the Ashtar Command. The belief system associated with the Ashtar Command has been centered upon several charismatic figures that claimed they had the ability to channel messages from Ashtar. Although these key individuals would be recognized as authorities, they would not necessarily be seen of leaders of any particular group. Instead, ultimate leadership of Ashtar Command is relegated to the figure Ashtar, and those communicating his message would be seen as important figures but not in charge of the ET operations or Ashtar Command. Some of the key channelers of Ashtar were George Van Tassel, Robert Short, Thelma Terrill (Tuella), and Yvonne Cole. Assassinations of President Kennedy, Mairtin Luther King, Malcom X, and Robert Kennedy “all are connected to an over-all policy. They were assassinated either because they were in someone’s way, or to create a reason for a future purpose” (Van Tassel 1968:9). The Great Pyramid of Gizeh, [sp] Egypt, is the only existing structure on Earth that remains intact after 25,816 years. It is the greatest power plant every built on this planet. At the time of its use it could furnish more power than the generators at Niagara Falls could produce in a thousand years (Van Tassell 1972:9). One of the most controversial aspects of Van Tassel’s message was his interpretation of the Bible. Although this form of analysis is common now, having been made famous by Erich von Daniken in his book Chariots of the Gods? (1968) and later promoted by other UFO religious groups like the Raelian Movement in the 1970s, in the 1950s it did create controversy. Van Tassel believed the Bible contained true information regarding ET activity upon Earth, information that was misinterpreted and misrepresented by the religious authorities at the time. By reading carefully Matthew 1:18-25 it is plain that Joseph became the husband of Mary “before they came together” after “she was found with child.” In Matthew 1:25 it is made clear that “Joseph knew her not.” It is evident that Joseph was the same as a step father to Jesus. There was no blood of Joseph in Jesus. Mary is one of the space people; one of the “male and female” that God created (Gen. 1:27) before he ended His Work (Gen. 2:2), and before the crossbreeding of Adam and Eve took place. Mary volunteered for the assignment of bringing, through birth, to the Earth, a son of the Adamic race of man. Jesus also accepted the assignment knowing before his Earthly birth what it entailed. There was also a significant problem with the continued failed prophecy occurring within the Ashtar Command Movement. It seemed clear that messages indicating the imminent arrival of the Ashtar Command forces were wrong. Most of the messages being channeled from Ashtar in the 1950s and 1960s have detailed accounts of mass landings, large-scale contact between ETs and earthlings, complex rescue operations, and even mass evacuations of people from the planet. These failings began to take a toll on the Ashtar Command Movement, principally because there was no central authority to filter the messages or present a clear response to alleviate the confusion and distress caused by the continued failed prophecy. Image #1: Photograph of George Van Tassel. Image #2: Photograph of the “Integratron” circa 2012. Image #3: Photograph of Reverend Robert Short. Image 4: Photograph of Tuella (Thelma B. Terrill). Image #5: Image of Ashtar and Jesus Christ. 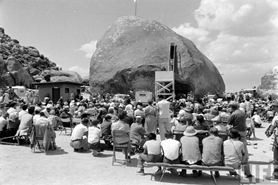 Image #6: Photograph of the 1957 Giant Rock Convention. Bishop, Gregory and Kenn Thomas. 1999. “Calling Occupants: The Giant Rock Conventions.” Fortean Times 118. 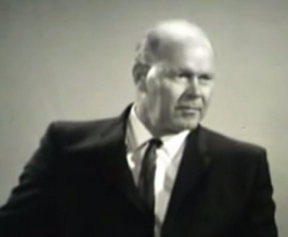 George Van Tassel 1964 interview.1964. Accessed from https://www.youtube.com/watch?v=g7zC–A_mEk on 20 November 2016. Helland Christopher. 2003a. “From Extraterrestrials to Ultraterrestrials: The Evolution of the Concept of Ashtar.” Pp. 162-78 in UFO Religions . edited by Christopher Partridge. London: Routledge. Helland, Christopher. 2003b. “The Ashtar Command.” Pp. 497-518 in Encyclopedic Sourcebook of UFO Religions , edited by James R. Lewis. New York: Prometheus Books. Helland, Christopher. 2000. “The Ashtar Command.” Pp. 37-40 in UFO’s and Popular Culture: An Encyclopedia of Contemporary Myth , edited by James R. Lewis. Santa Barbara: ABC-CLIO. Life Magazine. 1957. “A Saucer Session for Spaceship Sighters,” May 27. Tuella. 1985. Ashtar: A Tribute. Deming, NM: Guardian Action Publications. Van Tassel, George. 1976. When Stars Look Down. San Diego: Trade Services Publications. Van Tassel, George. 1968. Proceedings of the College of Universal Wisdom, Volume 8 (7). Van Tassel, George. 1957. Proceedings of the College of Universal Wisdom, Volume 5 (4). Van Tassel, George. 1952. I Rode a Flying Saucer. Los Angeles: New Age Publishing. von Daniken, Erich, 1968. Chariots of the Gods? Berkeley Publishing. Van Tassel, George. 1968. Religion and Science Merged. Yucca Valley, California: Self-Published. Van Tassel, George. 1958. The Council of Seven Lights. Los Angeles: DeVorss & Co.
Van Tassel, George. 1956. Into This World and Out Again. Yucca Valley, California: Self-Published. Tuella. 1995. A New Book of Revelation . New Brunswick, NJ: Inner Light Publications. Tuella. 1994. Ashtar: Revealing the Secret Identity of the forces of Light and their Spiritual Mission on Earth. New Brunswick, NJ: Inner Light Publications. Tuella. 1983. Lord Kuthumi: World Messages for the coming Decade. Deming, New Mexico: Guardian Action Publications. Tuella. 1982. Project World Evacuation. Deming, New Mexico: Guardian Action Publications. Bishop, Gregory and Thomas, Kenn 1999. “Calling Occupants: The Giant Rock Conventions.” Fortean Times 118. Gulyas, Aaron John 2013. Extraterrestrials and the American Zeitgeist: Alien Contact Tales Sine the 1950’s. London: McFarland and Company. Kersteller, Todd. 2015. Inspiration and Innovation: Religion in the American West. Oxford: Wiley and Sons. Short, Robert. 1952. Out of the Stars: A Message from Extraterrestrials. West Conshohocken, PA: Infinity Publishing. Republished by Six Star Publishing 2003. Stollznow, Karren. 2014. Language Myths, Mysteries and Magic. Palgrave MacMillan: London. Tuella. 1995. A New Book of Revelation. New Brunswick, NJ: Inner Light Publications. Tuella. 1983. Lord Kuthumi: World Messages for the coming Decade. Deming, NM: Guardian Action Publications. Tuella. 1982. Project World Evacuation. Deming, NM: Guardian Action Publications. Van Tassel, George. 1976. When Stars Look Down. San Diego, CA: Trade Services Publications. Van Tassel, George. 1972. Proceedings of the College of Universal Wisdom, Volume 9 (9). Van Tassel, George. 1971. Proceedings of the College of Universal Wisdom, Volume 9 (8). Van Tassel, George. 1969. Proceedings of the College of Universal Wisdom, Volume 8 (10). Van Tassel, George. 1968. Religion and Science Merged . Yucca Valley, California: Self-Published.